To learn about the University Square Rain Garden click the project description below for 2015 GI Grant Winners. To learn about the YWCA Homewood-Brushton Rain Garden click the project description below for 2016 GI Grant Winners. 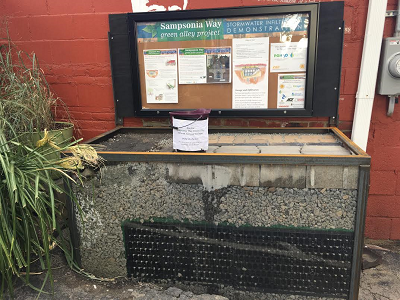 To learn about the Samsonia Way Stormwater Infiltration Education Project click the project description below for 2016 GI Grant Winners. To learn about the River Avenue Tree Planting Project click the project description below for 2015 GI Grant Winners. To learn about the 4129 Butler Street Stormwater Management Project click the project description below for 2015 GI Grant Winners. To learn about the Stanton Heights Neighborhood Rain Garden Project click the project description below for 2016 GI Grant Winners. 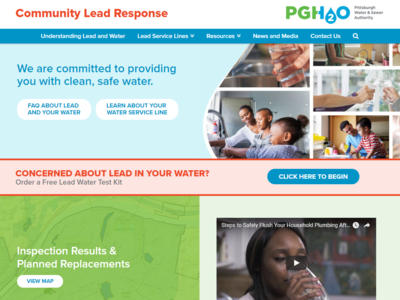 Pgh2o.com/lead-facts has what you need to understand lead in drinking water here in the City of Pittsburgh. 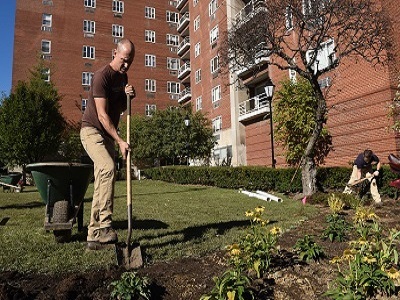 In 2015, PWSA began a grant program designed to support local, grassroots efforts that employ green infrastructure (GI) projects to manage stormwater. PWSA aims to increase GI in the City of Pittsburgh by encouraging everyone to get involved. Projects supported by this program will improve water quality, boost the local market for GI design and installation services, increase public awareness of GI benefits, and stimulate economic development. Check out the project descriptions for the 2015 GI Grant Winners. Check out the project descriptions for the 2016 GI Grant Winners. If you would like to be notified regarding the next round of the GI Grant Program, please fill out the interest form linked here. Check out the Matching Grant Application here, the Mini Construction Grant Application here and the Mini Education Grant Application here. Find answers to FAQs regarding PWSA's Green Infrastructure Grant Program here. If you have additional questions about green infrastructure, please contact us at greeninfrastructure@pgh2o.com.